Provost Dan Linzer speaks at Associated Student Government Senate on Wednesday. Linzer defended former U.S. Ambassador to Afghanistan Karl Eikenberry’s appointment as executive director of the Buffett Institute for Global Studies. Faculty Senate voted Wednesday to support former U.S. Ambassador to Afghanistan Karl Eikenberry’s appointment as executive director of the Buffett Institute for Global Studies. 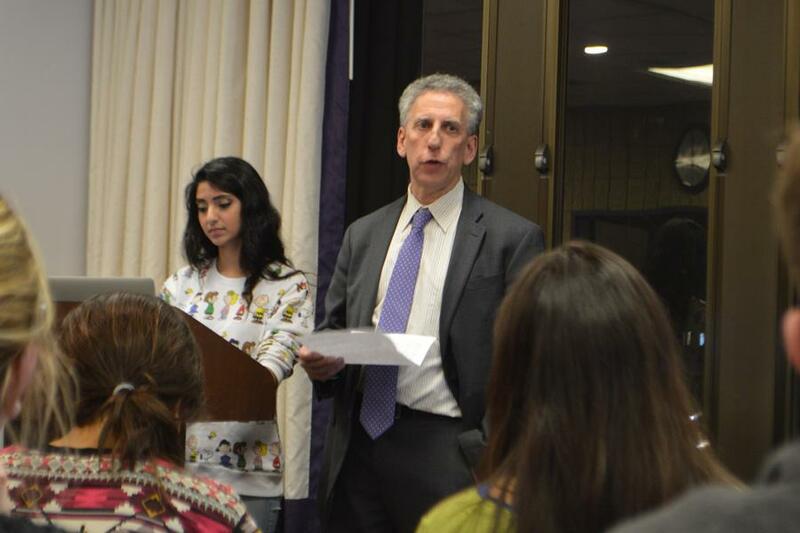 Associated Student Government Senate considered a resolution that calls on Northwestern to rescind the appointment, but postponed a vote on the resolution for two weeks. Faculty Senate’s motion passed 30-5 with 9 abstentions. Of the more than 80 members of Faculty Senate, 44 were present to vote. Communication Prof. Bob Hariman, a faculty senator, said faculty members learned of the motion roughly three hours before the meeting and were pressed to vote on it before ASG Senate considered a resolution criticizing Eikenberry later that evening. The ASG resolution, authored by Weinberg senior Neha Reddy and SESP junior Matt Herndon, came after a letter to the editor in The Daily signed by 46 Northwestern faculty criticizing Eikenberry’s appointment due to what they described as his alignment with the U.S. government. The letter also warned against using humanities and social science research to advance American interests abroad, an idea the writers of the letter say Eikenberry encouraged. University President Morton Schapiro and Provost Dan Linzer responded with their own letter to The Daily saying Eikenberry’s experiences make him fully qualified for the position. Eikenberry, who currently works at Stanford University, retired from the Army in 2009 as a lieutenant general. He holds two master’s degrees, one from Stanford and one from Harvard University. Faculty Senate debated the issue for more than an hour before calling a vote on the motion. The senators discussed the issue at their previous meeting in early March, said economics Prof. Larry Christiano, a faculty senator who voted for the pro-Eikenberry motion. Political science Prof. Jacqueline Stevens said she supports the ASG resolution, calling the Faculty Senate vote a “sham” and a “travesty.” During the Faculty Senate meeting, Stevens said faculty did not have ample time to submit materials opposing Eikenberry’s appointment for senators to consider. Although Eikenberry lacks a doctorate, Christiano said his experience in international affairs qualifies him to lead the Buffett Institute. Christiano added that in order to find the best candidates, the search committee needed discretion. Soon after the vote at Faculty Senate, some faculty members attended ASG Senate for debate on the ASG resolution. Herndon and Reddy began the debate by listing concerns about Eikenberry’s qualifications. They critiqued his past career in the military in Afghanistan and statements they said Eikenberry has made on the role of the humanities and social sciences in advancing American “soft power” — the ability to influence other nations through example rather than force. Reddy said although Eikenberry possesses a respectable military record and two master’s degrees, he does not have a doctorate and is not an academic, making him unfit for the position. Linzer also attended the ASG Senate meeting and spoke in opposition to the resolution, arguing Eikenberry’s qualifications do not conflict with the requirements of the post. After nearly two hours of debate, Erik Baker, the senator for sexual health and assault-related groups, motioned to postpone voting for two weeks. The Weinberg senior said he made the motion to postpone after hearing factually contradictory arguments during the debate.